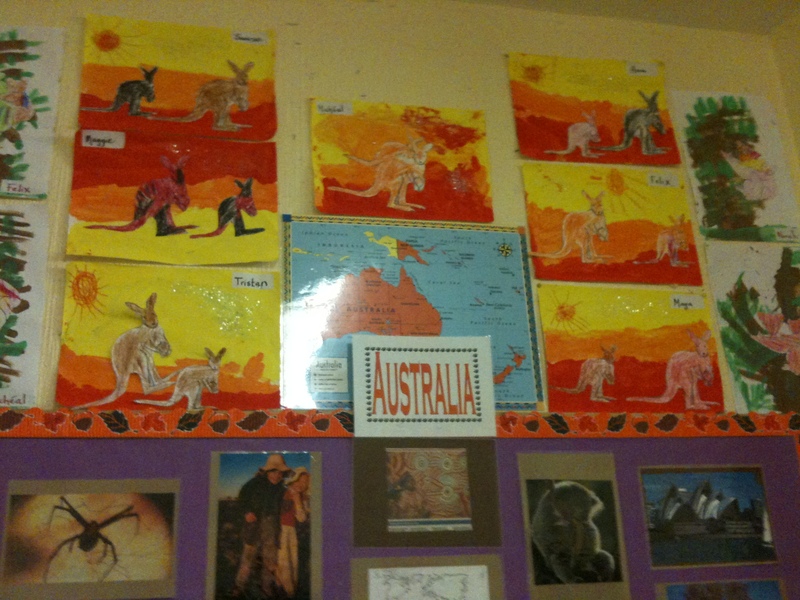 Here it is, the final September catchup from the Big School. 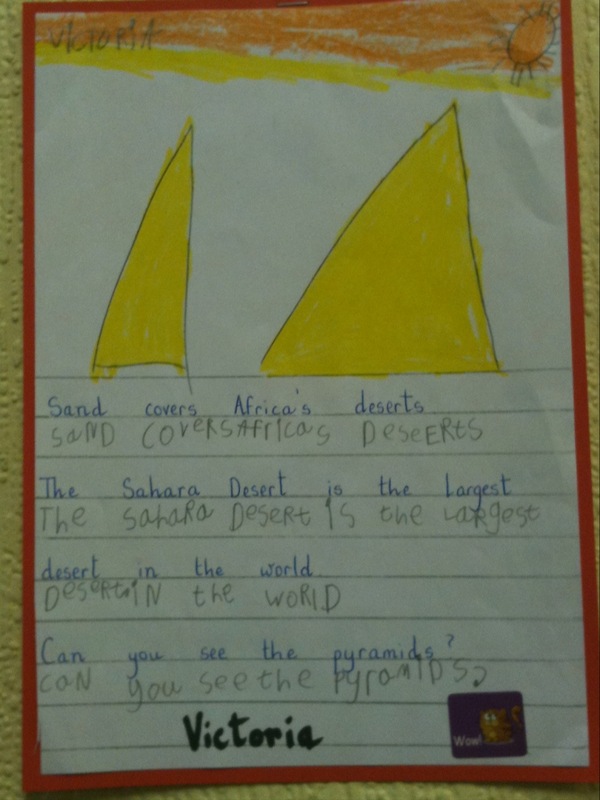 Where last but by no means least, is the news from our mixed age community First to Sixth Class. 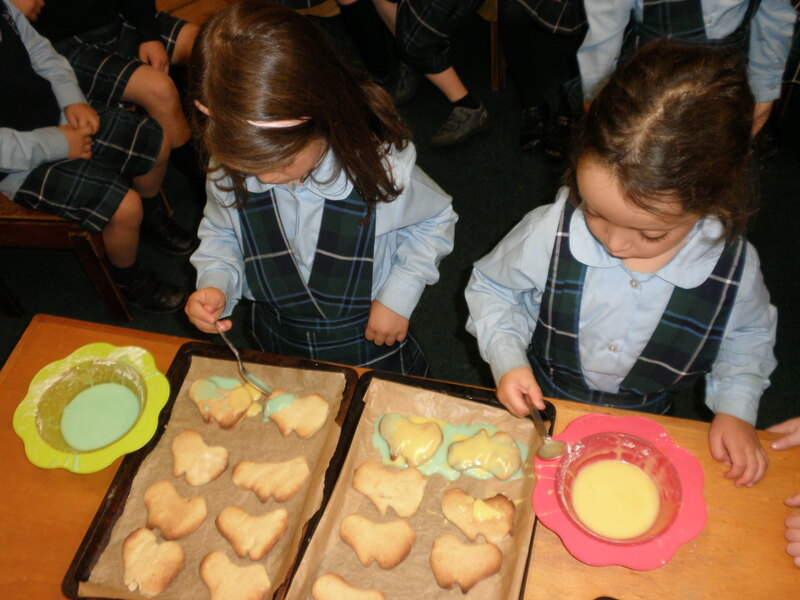 As our most wide-ranging age mixed class, first to sixth is a lovely student community to observe and engage with. 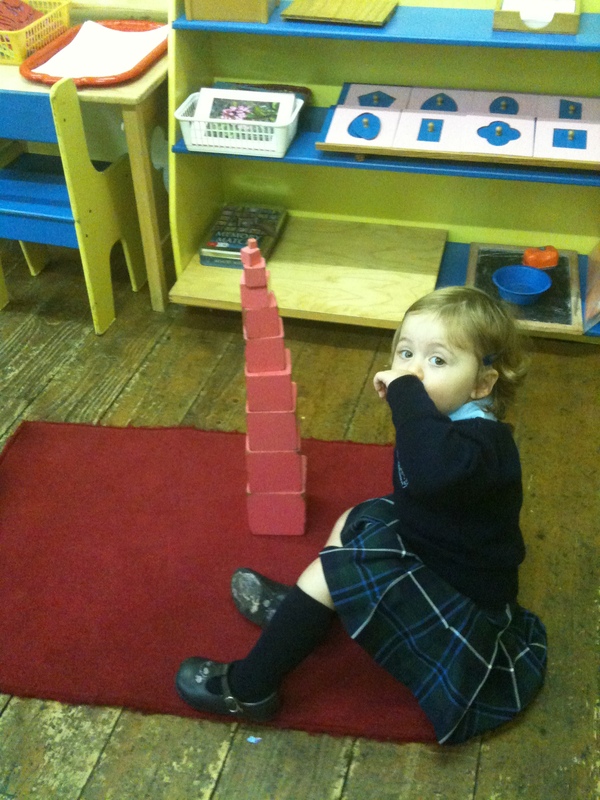 The Montessori method allows students to develop and engage at their own level and pace, with younger members being encouraged, inspired and aided by elder classmates. 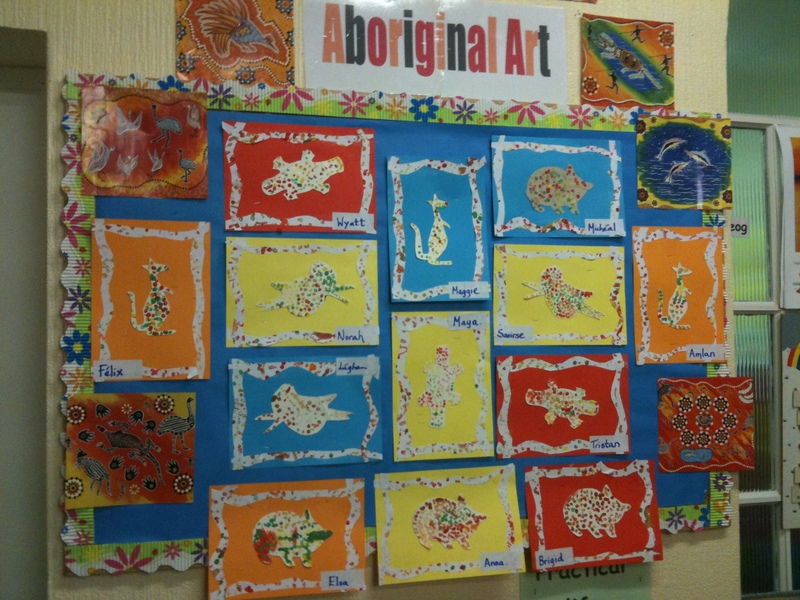 This is very evident in our eldest class grouping and the work they engage in is confirmation of the success of this collaboration. The overarching topic of study for the senior class this month has been Water. 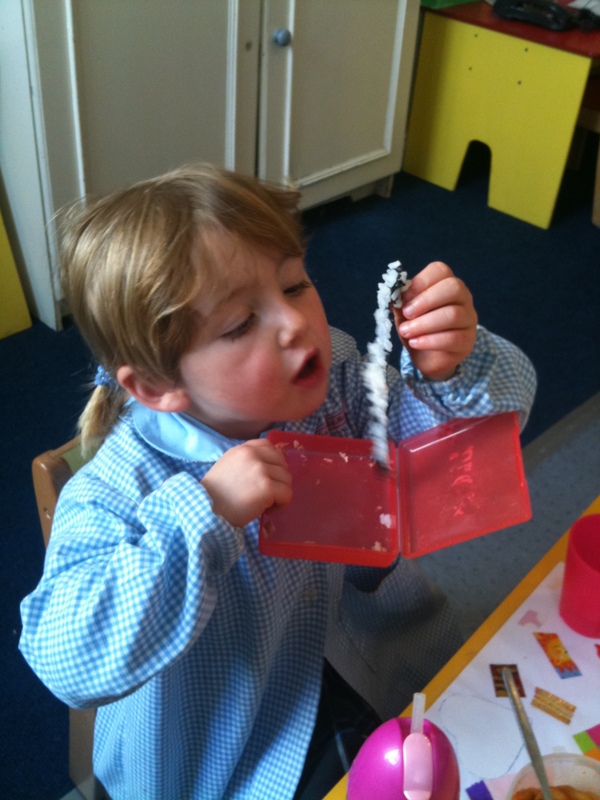 Again as with all classes in the “big school” the topic study is used to inform and frame the national curriculum studies while the students learning is reinforced by the hands on experience with the Montessori materials available in class. 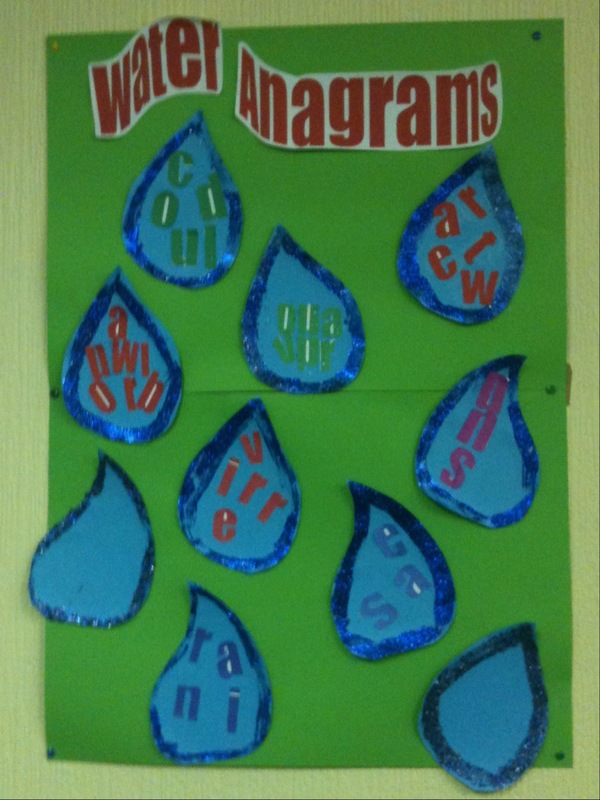 The students began by creating water anagrams as an exercise in english grammar and then went on to create a fantastic water cycle mural on the wall. 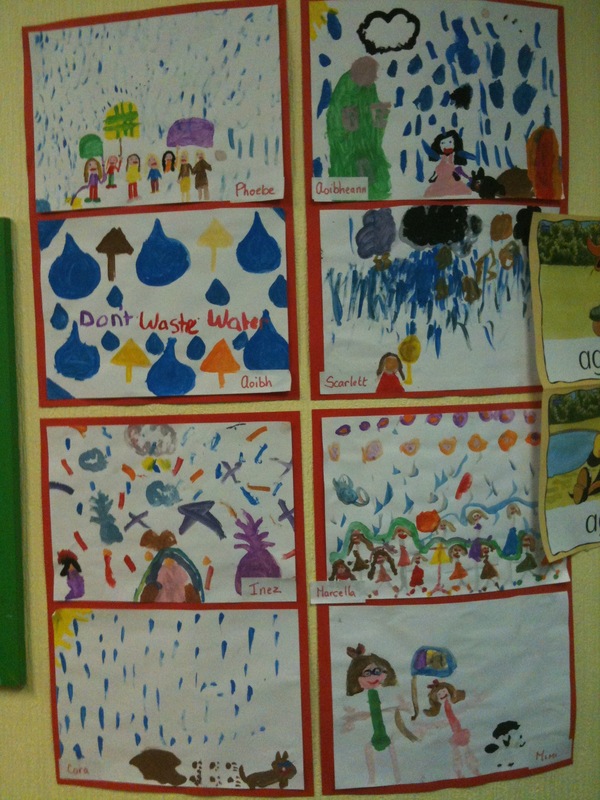 Researching labels and definitions for the water cycle on various internet children’s science sites. These exercises allow the students to engage with english grammar on a multisensory level, ensuring they absorb the knowledge in a fun and creative manner. The use of internet for research is a vital skill for students and internet enabled computers, supervised by staff, are available in all classrooms. 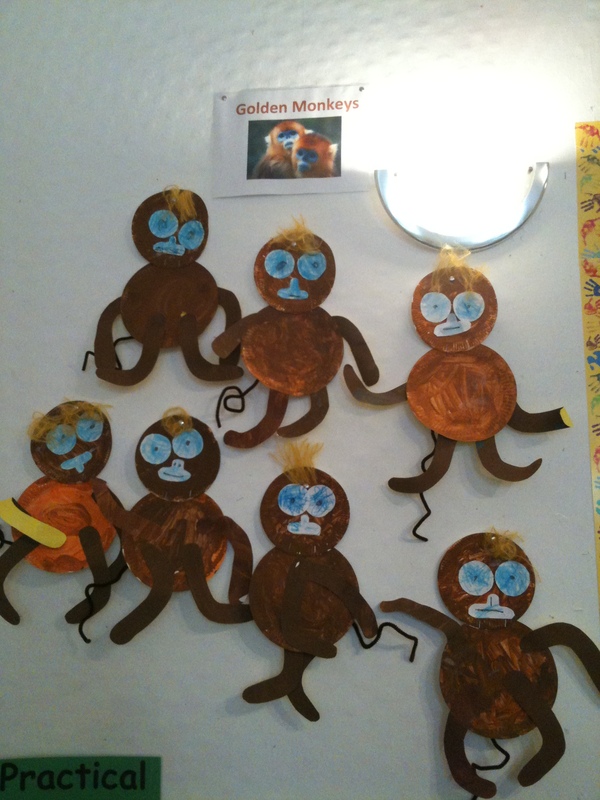 Using arts and crafts, alongside computers, books and other resources opens the students minds to the variety of research methods and forms of expression that exist and can be utilised to communicate messages to the world. As a class group using multimedia, art, and I.T to convey their learning allows all students to showcase their talents and develop new methods through teamwork with their classmates. Another benefit of the Montessori primary class structure is that it allows the learning and practical work to be student lead. On Tuesday 21st this was particularly inspirational when the students decided to measure the heavy rainfall that had been occurring. 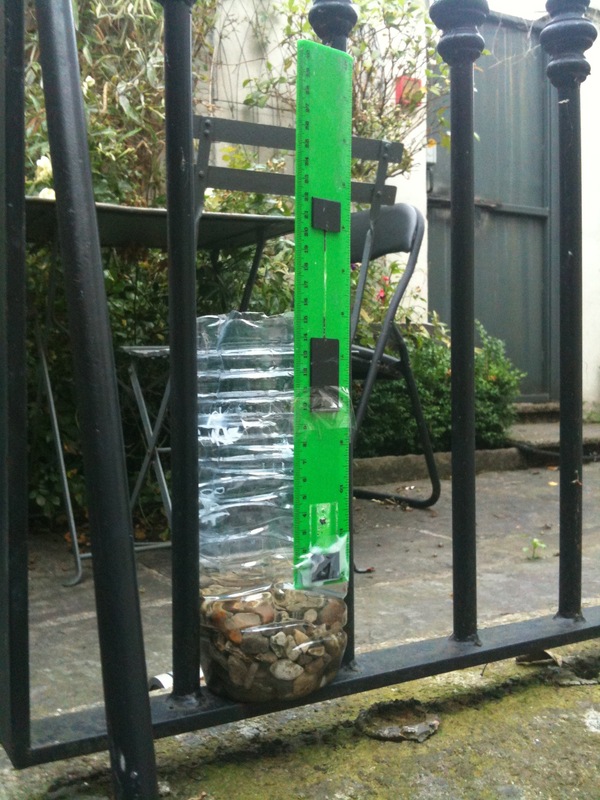 They created a temporary rainfall gauge and placed it in our patio area. From 9.30am – 10.30am they took record of 80ml of rainfall. The success of this experiment led them to create a more permanent instrument (pictured) and they are measuring rainfall over a period of a week to be recorded in their weather chart. I’m sure we’ll have the results of that in their next update. 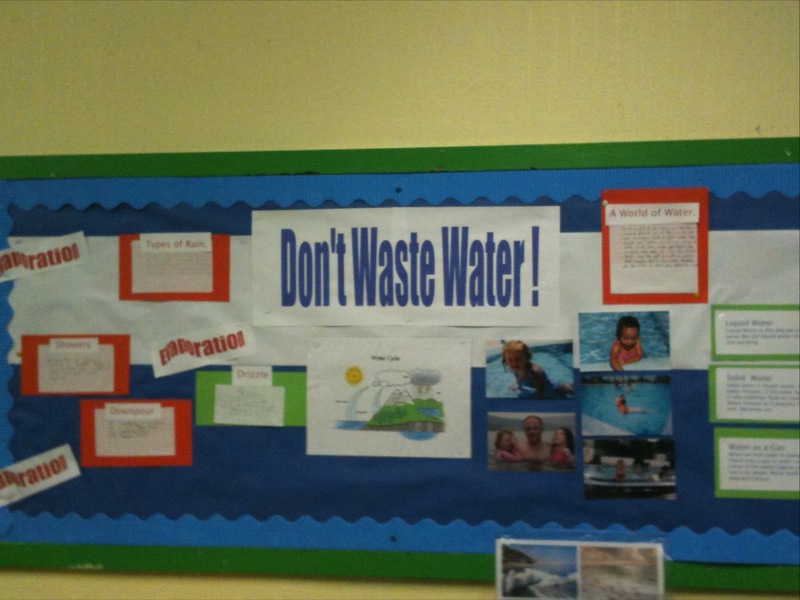 So with wise words from our school elders, Don’t Waste Water! we leave you for now, but expect more updates from them soon. Welcome back to more Big School News! 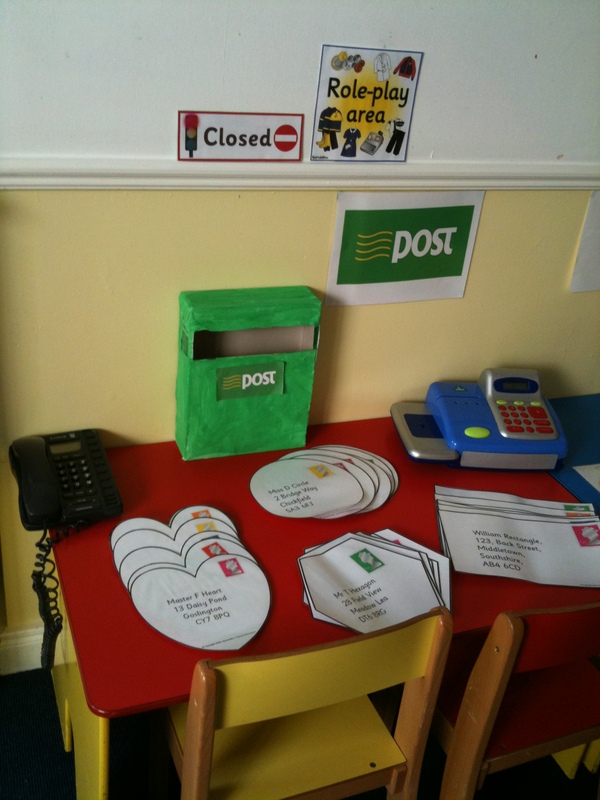 This post concerns the wonderful work taking place in our Senior Infants class so be prepared for some spectacular samples of their activity. Firstly we’d like to say thank you to all the visitors to our blog, we really appreciate your support and interest. There have been some extremely busy days on the blog, with Monday 20th Sept seeing 94 visitors in 24hrs! In total, as this piece is being written, we have received almost 500 visitors in the past 6 weeks. To anyone unfamiliar with blogging stats this is really positive and we are very pleased that your interest is so high. There are so many fantastic purposes of blogging for a Montessori school but the paramount one for Hedley Park is facilitating our parents sharing the precious moments of their child’s school days at home and with family members near and far. So please feel free to send the link to aunties, uncles, grandparents and cousins! There are special buttons at the bottom if you use Facebook or Twitter too! Learning about the Seasons is an integral part of the curriculum, it allows children to experience and appreciate nature, while honing their discrimination for colour, texture, scent and taste. 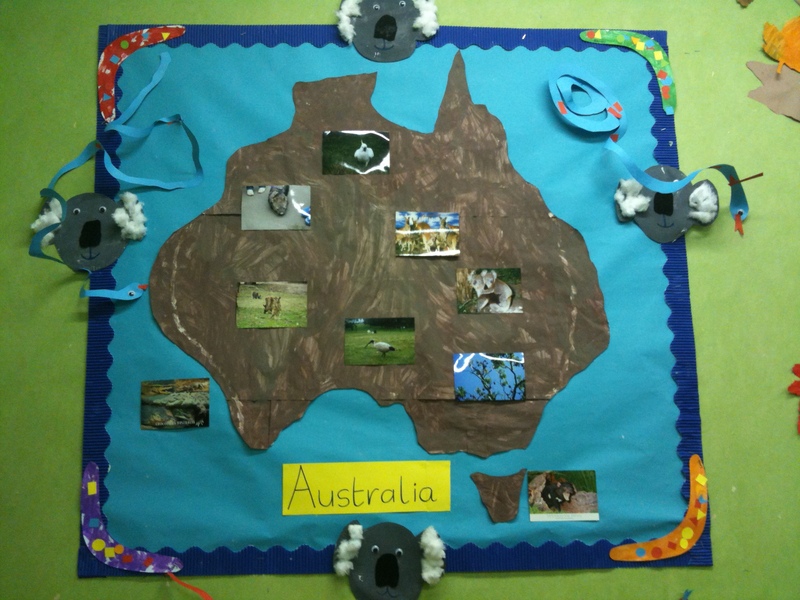 Talking about nature scenes and experiences allows children to develop their written and spoken language confidence. Finally the cyclic nature of the seasons appeals to the young childs sense of order and curiosity and inspires them to experiment with and question the changes in the world around them. 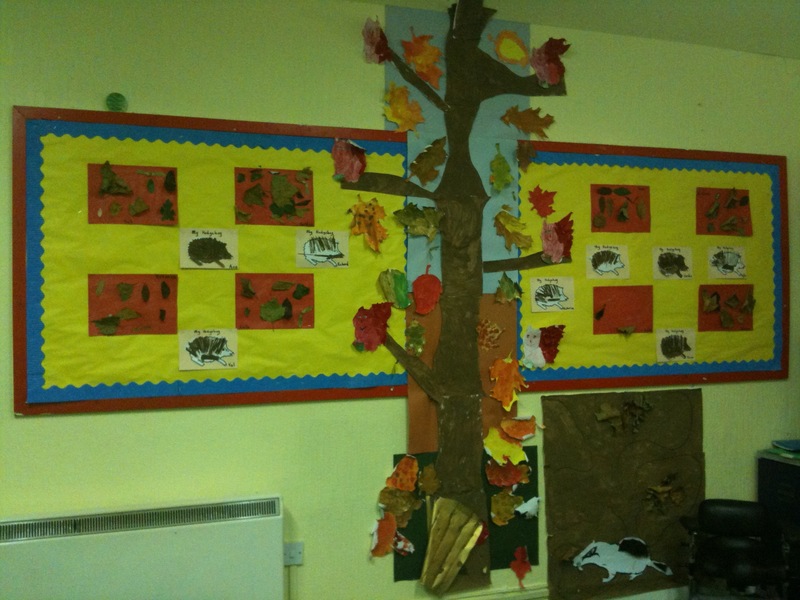 With the help of our artistic Emma the Senior Infants created their magnificent autumn sensorial wall complete with tree, tactile hedgehogs, leaf collages collected from nature walks in Merrion Square and a badger at home in his sett. 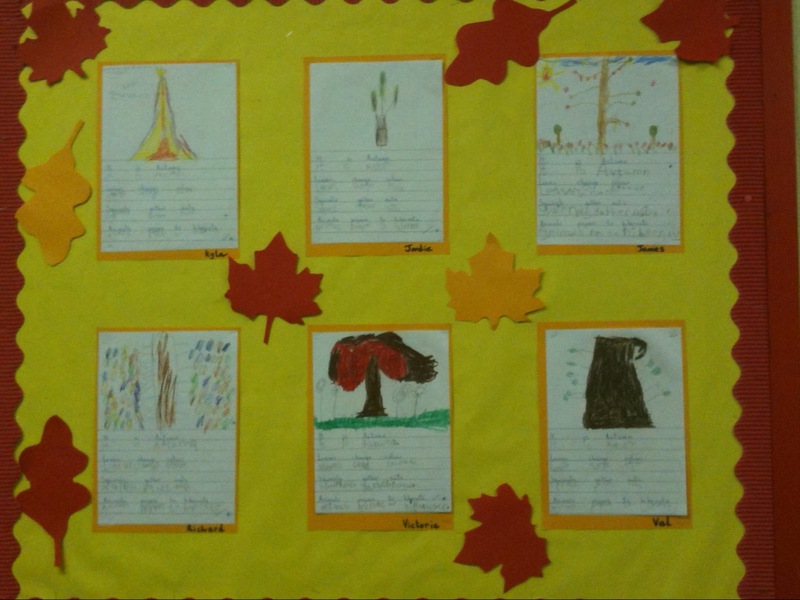 To supplement the autumn wall Aoife encouraged the students to perfect their written language and individual drawings with their descriptive seasonal handwriting samples. 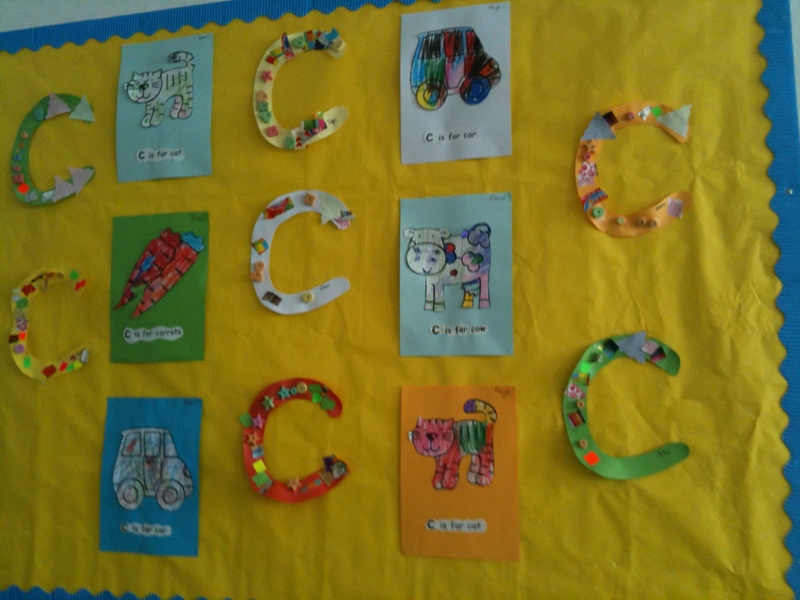 Our class themes frame and support the national curriculum workbooks used in class, while the Montessori method and materials allow the student to independently build on and concrete their learning in a hands on way that really resonates and remains long after the learning unit has been completed. 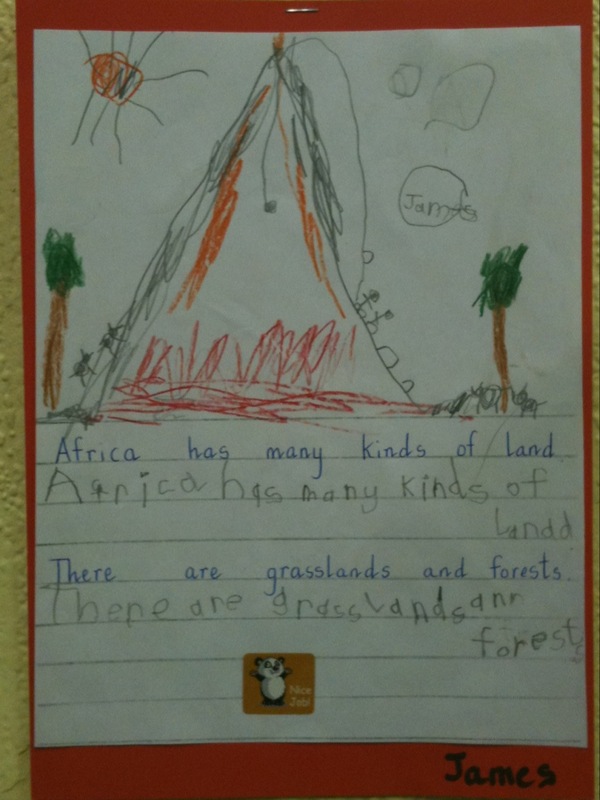 The second major theme of study for the Senior Infants is the continent of Africa. 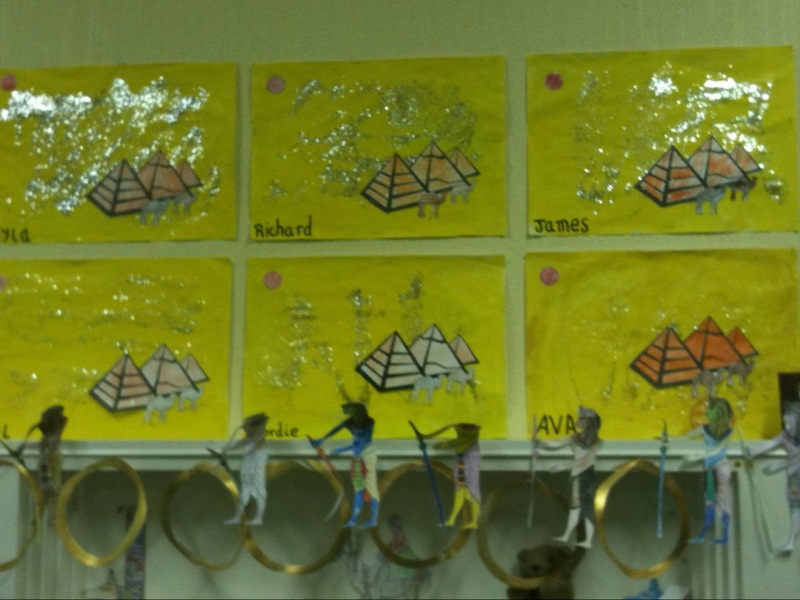 They have chosen to focus on Ancient Egyptian culture alongside African traditional jewelery, customs and topography. 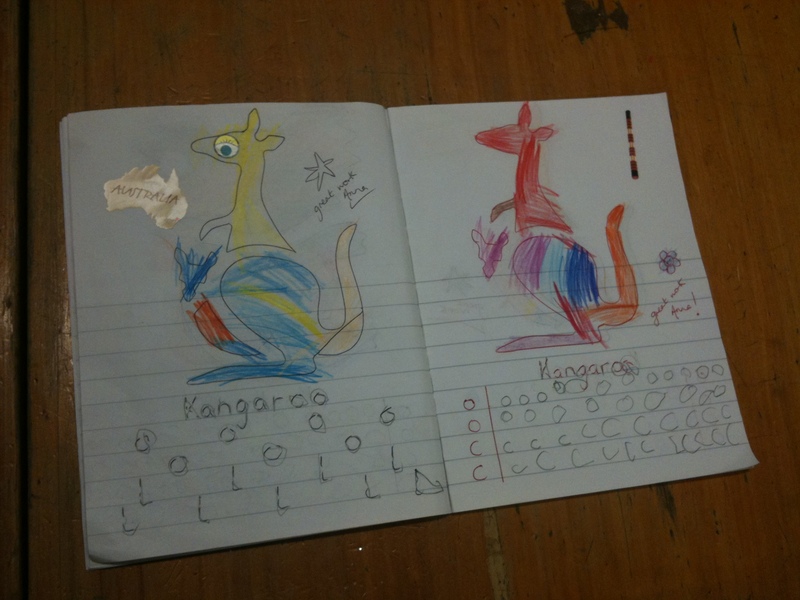 So as you can see the Senior Infants are getting stuck in and their work shows the effort put in by all concerned. Best wishes from all the staff and students of the Big School. 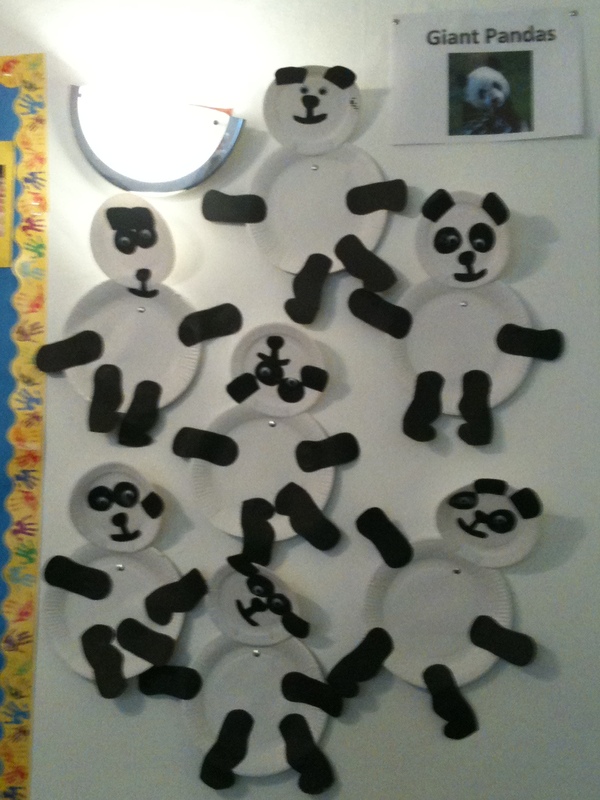 We are all very busy in Hedley Park Nursery these days. Everyone is in full on work mode and the buzz in the classrooms is fantastic. Our Asia project is taking shape and thanks to an artistic friend we drew a fantastic map of Continental Asia. Monday morning we all gathered round to wax crayon in the Indian and Pacific Oceans in the south and the Arctic Ocean in the North. Then painting smocks were donned and together we painted the continent its unique yellow colour. 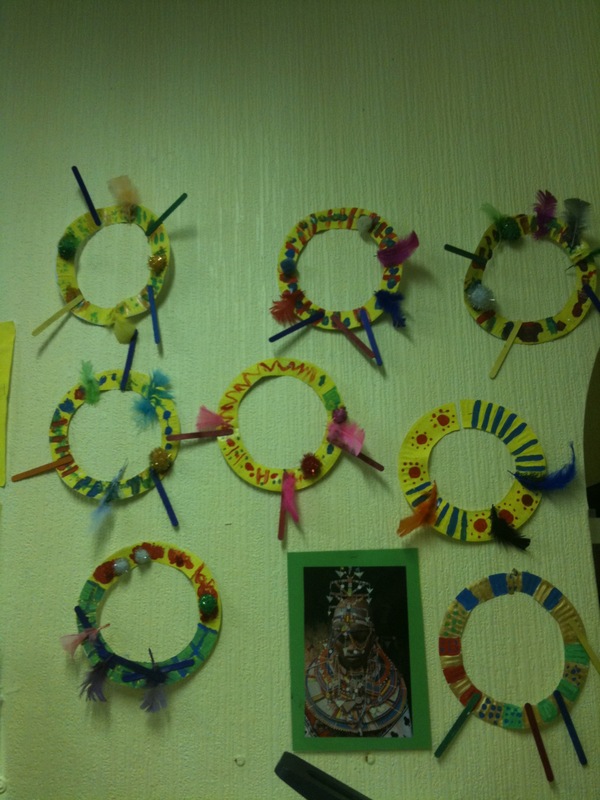 In Montessori all continents have a colour, and yellow represents Asia. This helps the child connect all the various images and cultural items, books and most importantly the map jigsaw together. 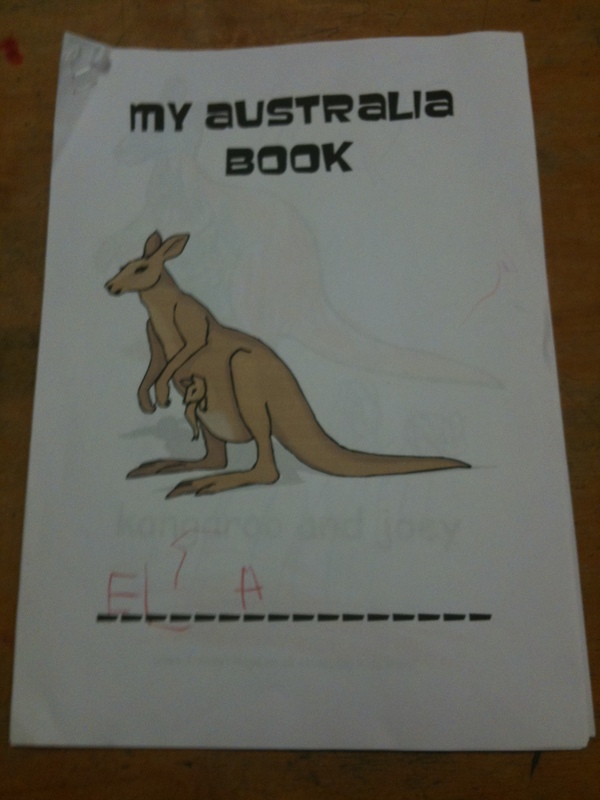 Giving the child a linked and unified perspective on each continent and a clear path for later recollection. 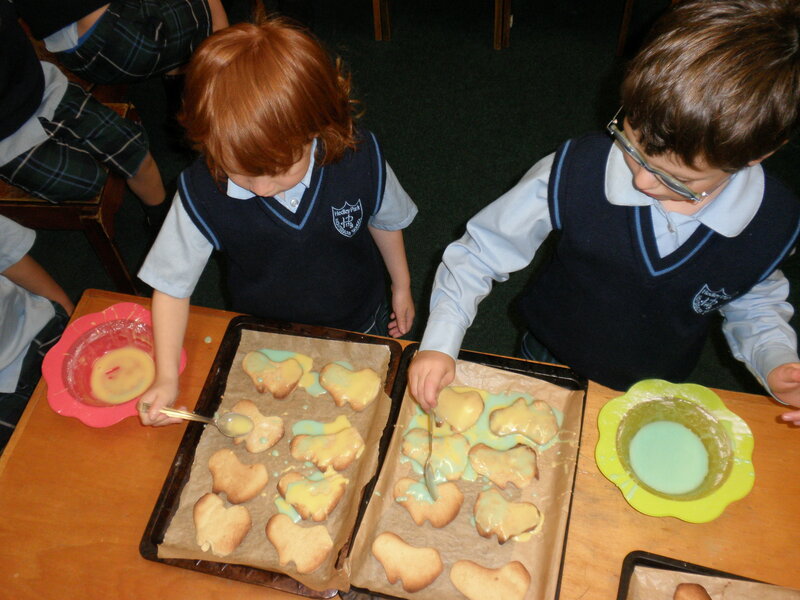 Each Thursday the junior and senior classes in the nursery join together for a cookery class. We try to alternate between sweet and savoury, always healthy, fresh and most of all fun! Everyone puts on their chefs hats and washes their hands as every child is encouraged to participate. Last week we voted on Jam Tarts! 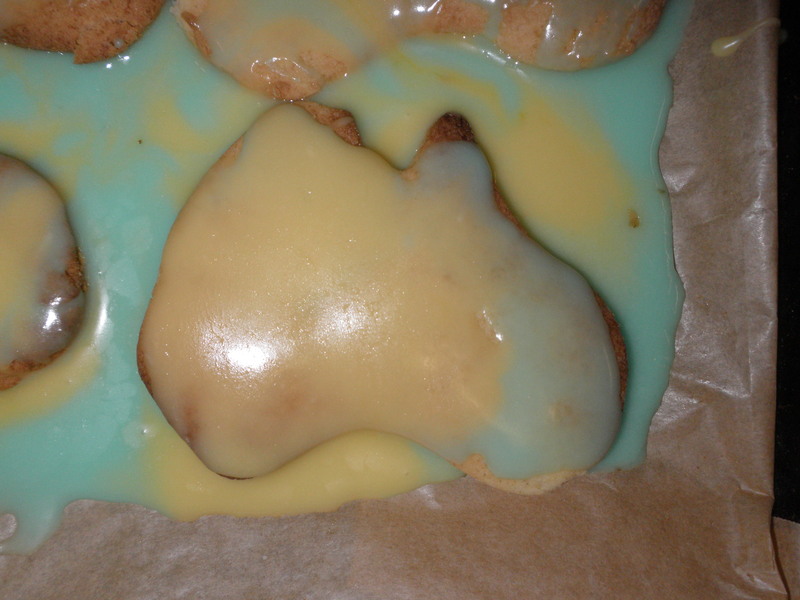 This is a great store-room treat, with lots of manipulative fun from rolling and cutting the pastry. 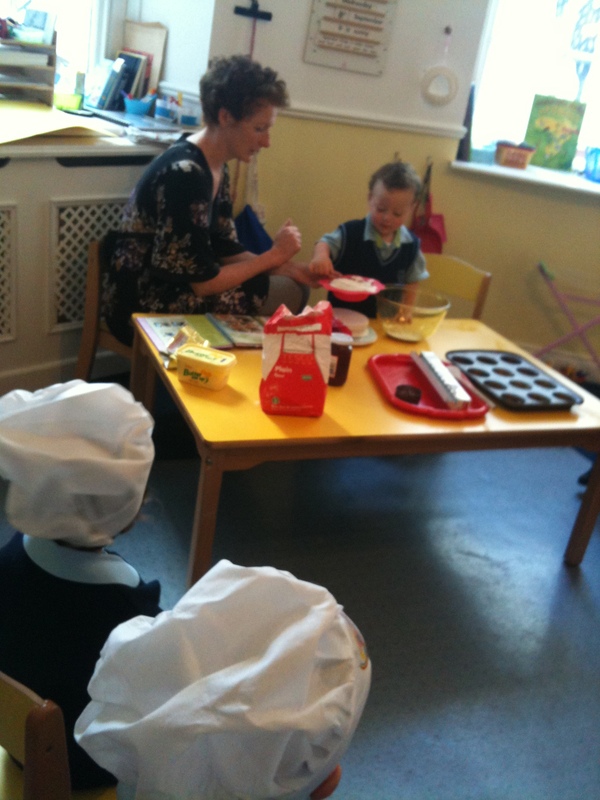 First we made the pastry, sieving and weighing are key skills. Then we greased the tins, little fingers love the minute of these tasks. Lots of rolling pins were ready once the pastry set. 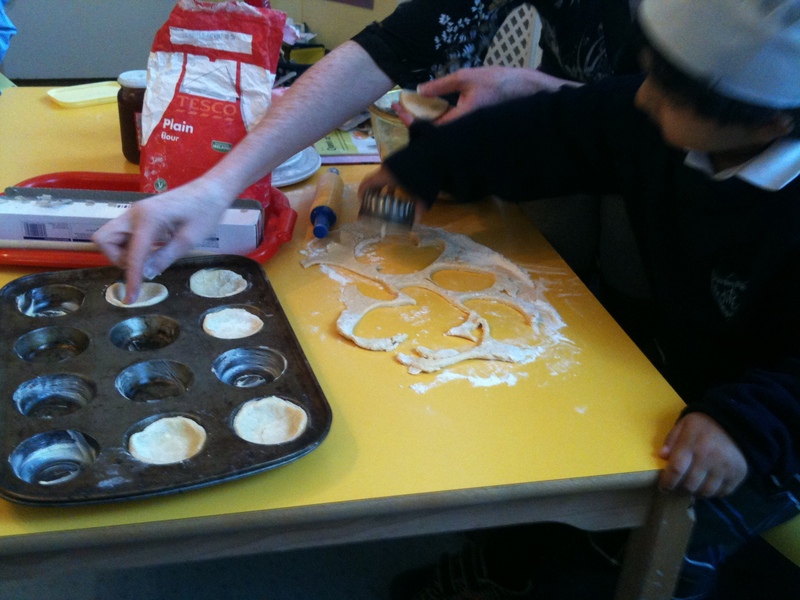 After the rolling we used the pastry cutter – hours at the playdough table coming in handy here. And finally spooning the jams and getting a teacher to help us put the tarts in the oven! Yum Yum! We needed no help eating our jammy creations later on. 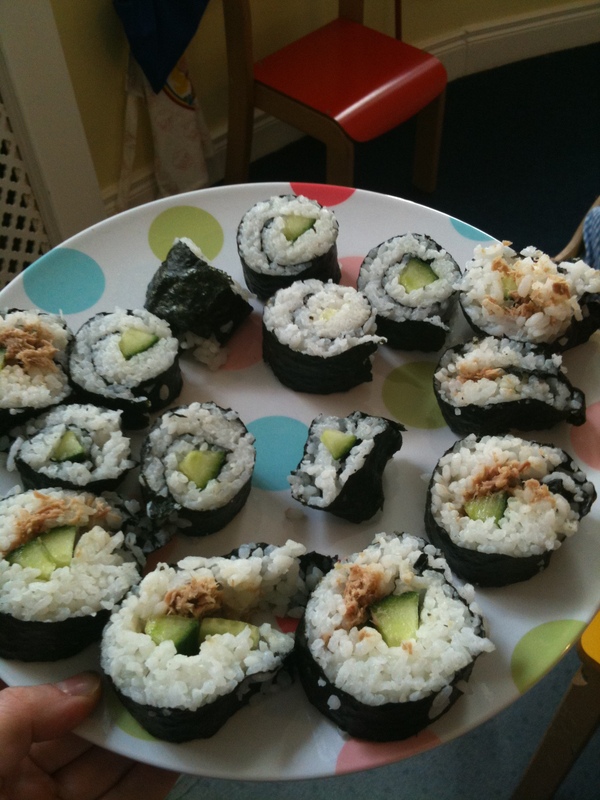 This Thursday we hope to try our hand at sushi! It will be great to make our own lunch, and try out new flavours. Hopefully our budding chefs will go easy on the wasabi. In the senior class our special sound – C is coming along nicely too! 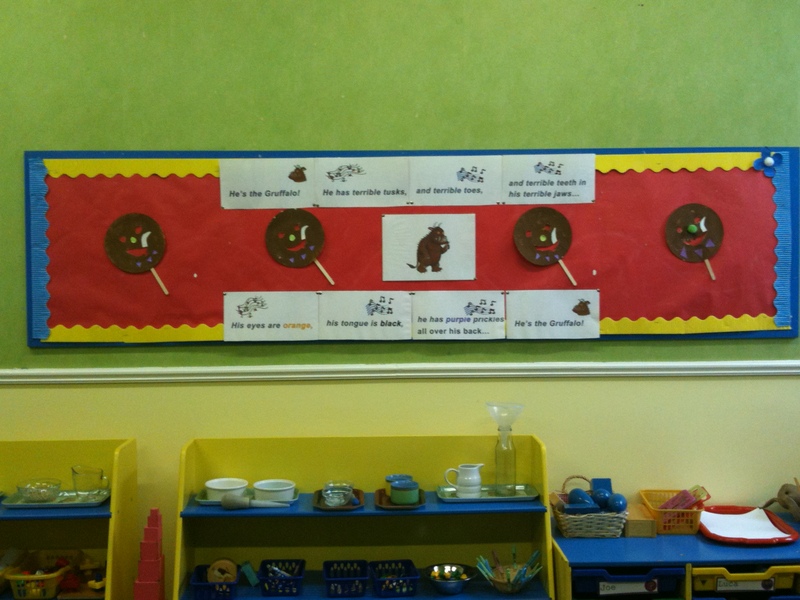 We have our tray choc-a-block with Clocks, Cars, Caterpillars, Cows, and Cats! There is still time to bring your special C to class! 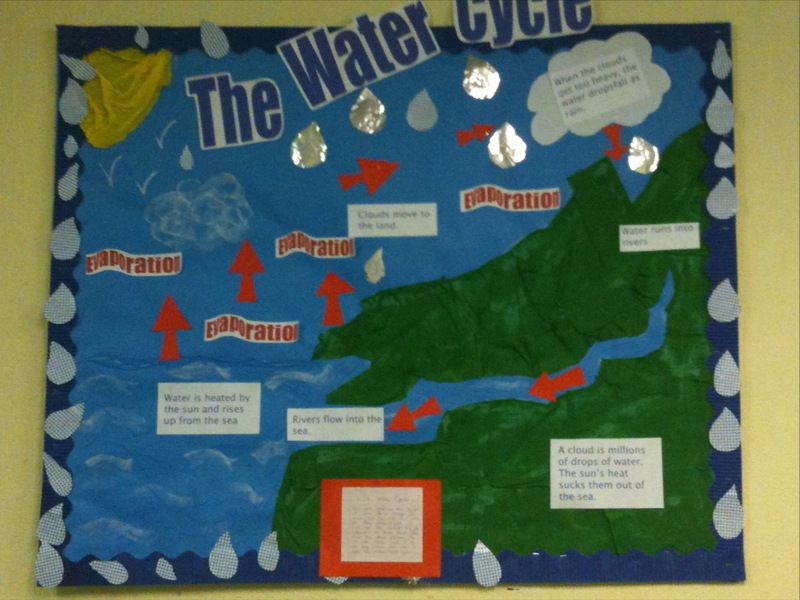 Check out our C board. On that note see you all soon for more Nursery News!